We build it so that it looks good and it lasts a long time! 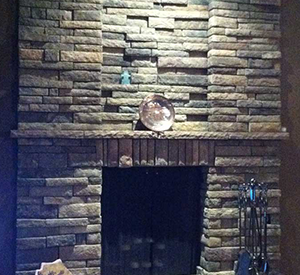 The Runde Company is experienced in many styles and types of masonry work for custom homes. We build masonry stem walls, conventional and Integra masonry walls, MSE retaining walls, fireplaces, glass block, and exterior patio walls. The Integra Wall System is a post tensioned foam filled cmu wall system that can be used for both residential and commercial jobs. 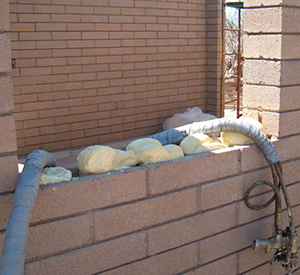 The post tension eliminates the need for rebar and grout and the foam increases the R-Value. This wall is available in several different finishes including plain cmu, split face, or colored cmu. For more information follow the link to Integra Walls. The Runde Company is experienced in installing cultured and natural stone veneer and precast concrete faces. MSE stands for "mechanically stabilized earth". These are dry-stacked walls with no footings, only a gravel base. The strength comes from reinforcing the soil behind the wall with fabric or "geo-grid". 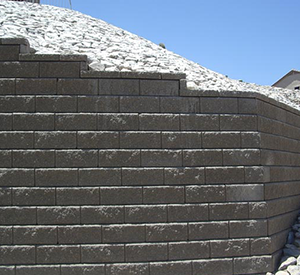 We build 3 types of walls: Allan Block, Keystone Block, or GravityStone/StoneWall.